How’s that for an oldy? 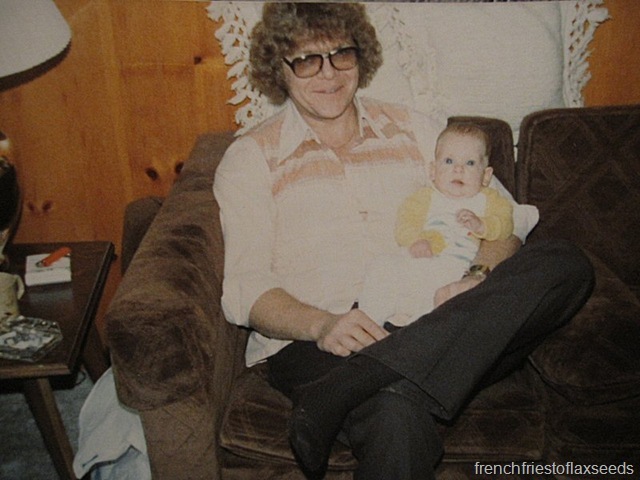 That would be me and my dad when I was a chubby little baby (and kinda looked like a boy?). Keep in mind it was either late 1979 or early 1980, so that perm was in stylin’! Not only was it my dad’s birthday, but we had out first touch of snow for the season. Mind you, it was the lightest dusting of snow ever, but it still counts. Hopefully we’ll actually get some accumulation this weekend. Fingers crossed! 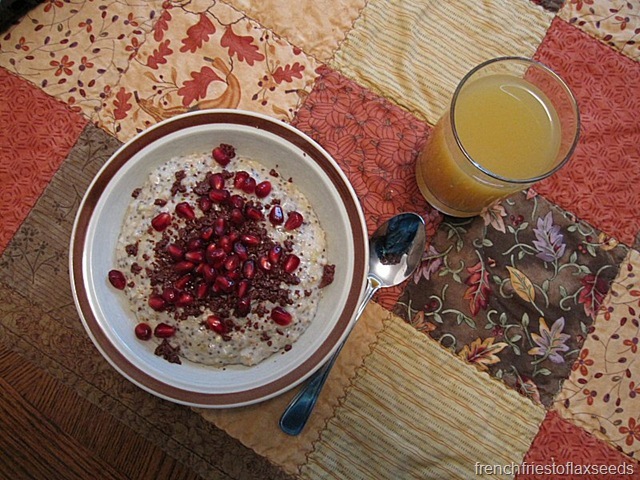 I started my Friday off with a nice bowl of oatmeal. Happy Planet Mango Peach Party for the accompanying beverage. 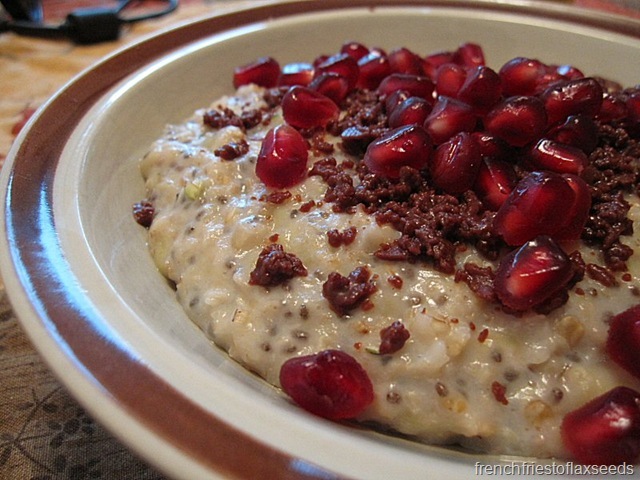 Such a pretty bowl of oats. 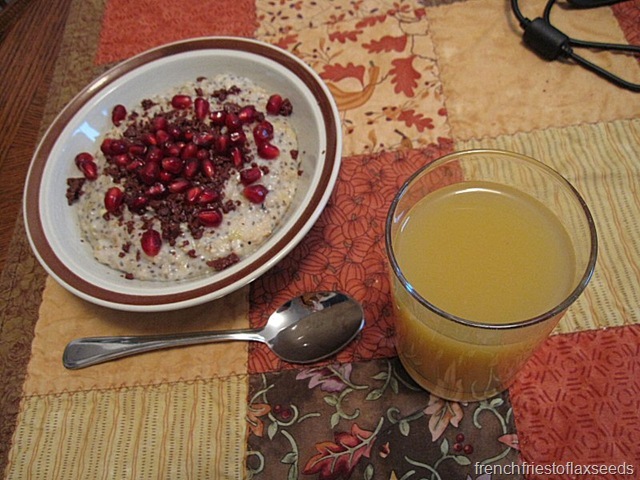 I followed this stellar breakfast with psychology studying. I know, is that all I do these days? I need to get onto some biochem soon though, as that exam is only two days after my psych exam. I’m shooting for some major biochemistry learning tomorrow. I had a doctor’s appointment right around lunch time, so I passed on lunch before I went, figuring I’d be back soon afterwards. Too bad I waited 40 min just to get called into the exam room, then another 15 min to see the doctor. Grrr. I hate when that happens. Talk about a waste of my afternoon. So I did a little shopping on my way home, with the aid of many coupons. 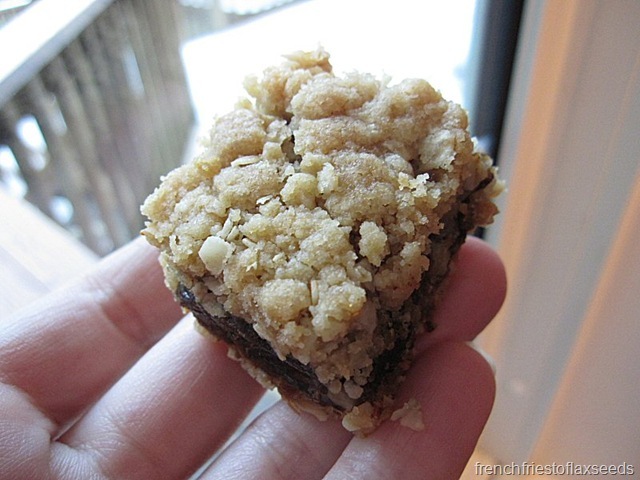 I spent maybe $2.00 in total – check out what I got! 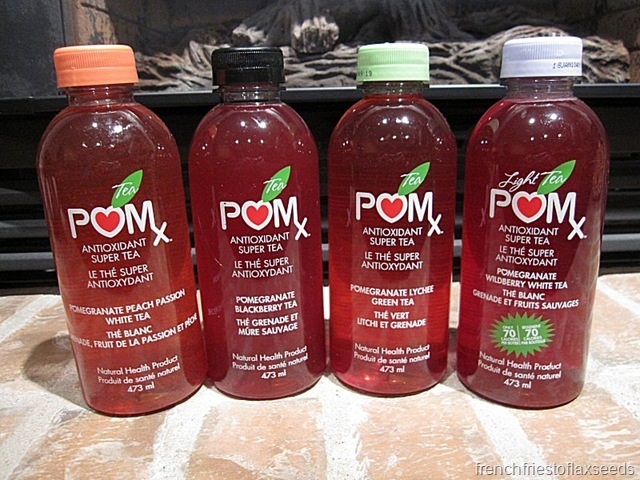 POMx Antioxidant Super Tea (free (excluding tax/deposit) – coupons courtesy of the lovely people at POM to review their products). I got one of each flavour available: Peach Passion White Tea, Blackberry Tea, Lychee Green Tea, and Wildberry White Tea Light. 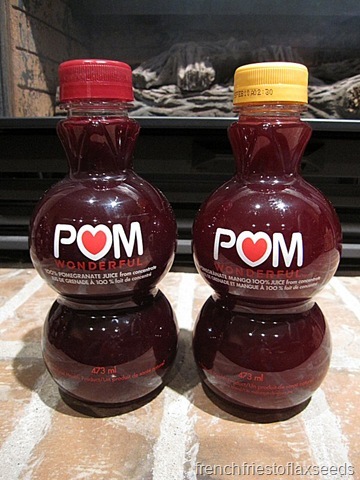 POM Wonderful Pomegranate Juice – Au Natural and Pom-Mango (free, see above). 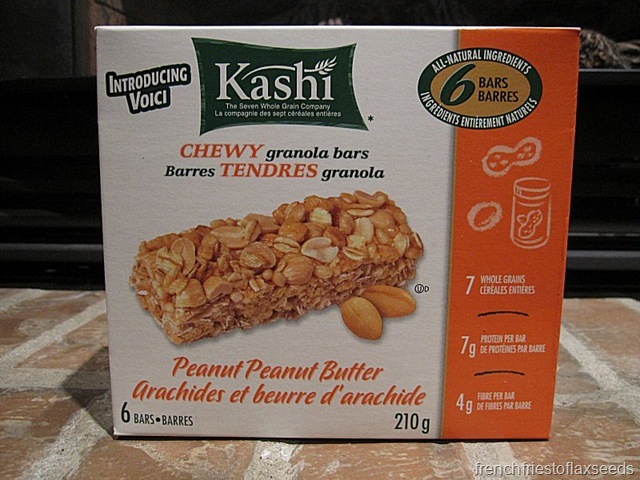 Kashi Peanut Peanut Butter Chewy Granola Bars (free (excluding tax) – coupon that I signed up for on the Kashi website). So what prompted the mass coupon shopping excursion? I realized they all expire on Dec 31st! I couldn’t let them go to waste, so I stocked up. 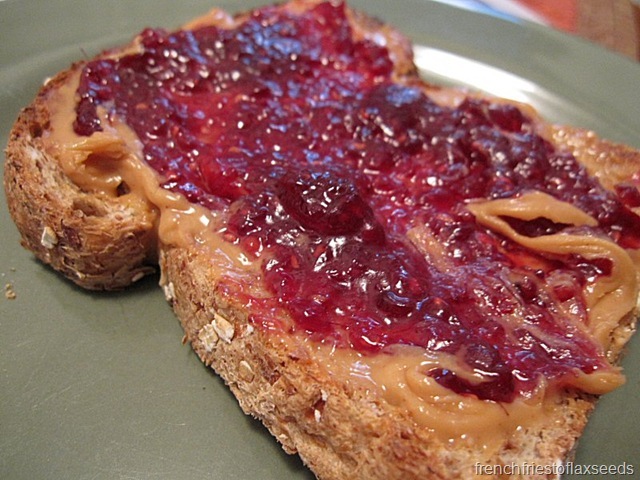 By the time I got home, it was really too late for lunch, but I was starving, so I went with toast + pb + j. And it was so damn good, I had another. Mom and dad went out for dinner with their friends for my dad’s birthday, and left me and my sister some cash to get our own dinner. 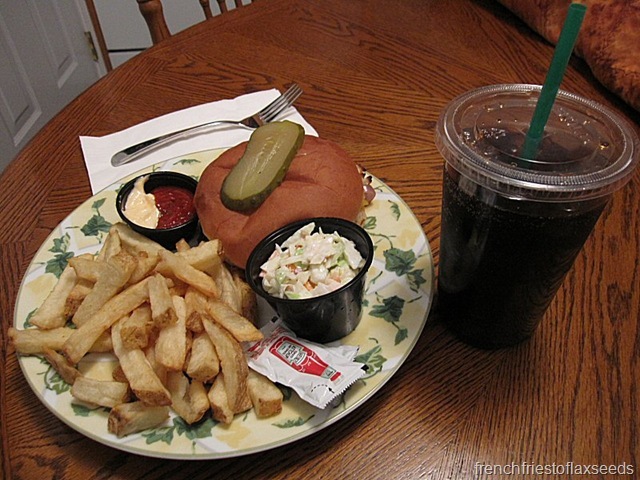 We decided on a family favourite – burgers from White Spot. I decided to mix it up and try out one of their feature burgers, John Bishop’s Burger – Inspired by John Bishop, owner of award-winning Bishop’s restaurant in Vancouver. Our 6 oz. 100% fresh Canadian beef burger with grilled and marinated sweet golden bell peppers and red onions, basil goat cheese, lettuce and mayo. 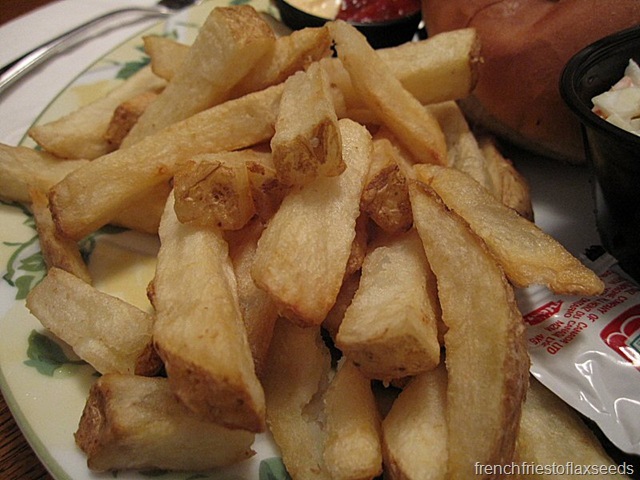 Of course, it came with their delicious fries. 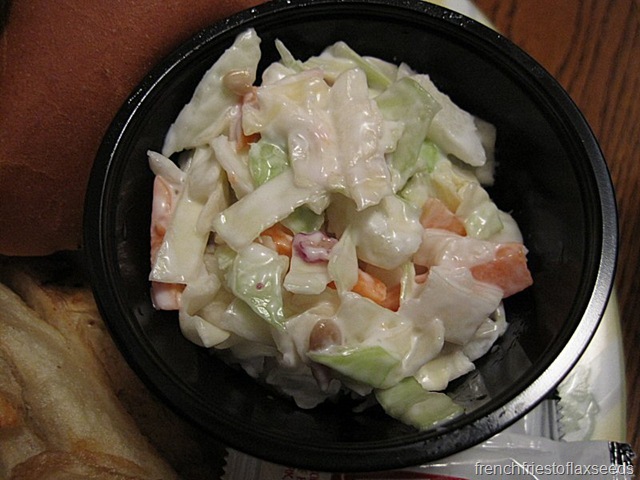 And a side of coleslaw. I even had a side of Triple “O” sauce for dipping (the sauce that MAKES their burgers). 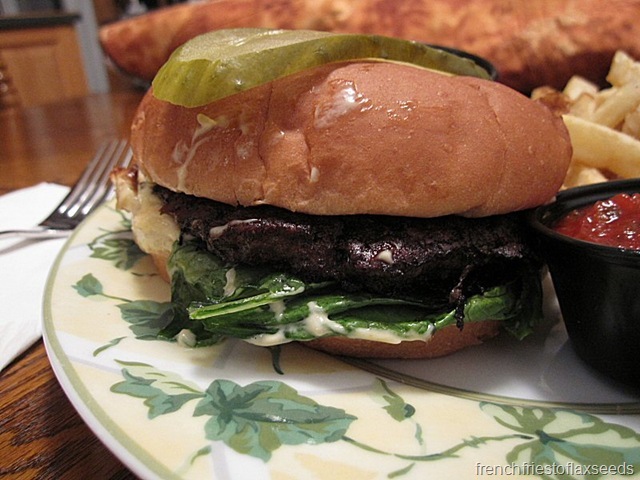 I liked the flavours of the burger, but I found the goat cheese to be a bit overpowering as I continued to eat the burger. I ended up scraping it off the last third or so. I was definitely full after this meal. But now…now I’m really going back to the studying. Time to go memorize all there is to know about Memory. Irony? I think so. Night! Happy b-day to your Dad! Happy birthday to your dad!! Yay for early holiday baking/candy creating! Can’t wait to see what you made! Aw happy bday to your dad!! 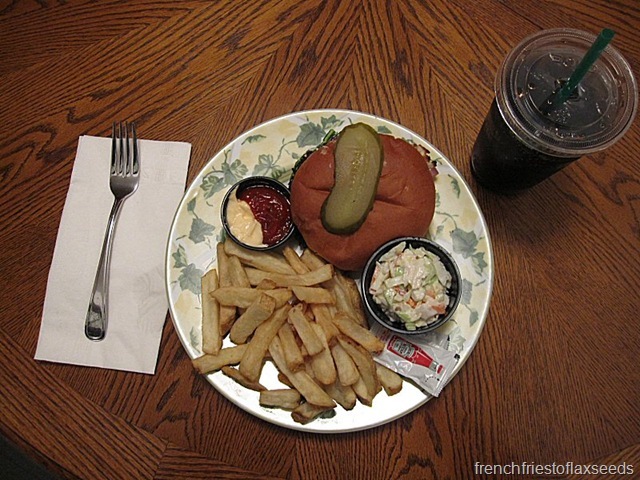 Yea, I enjoy goat cheese on things like salads and pizza, but I bet it would overwhelm a burger. 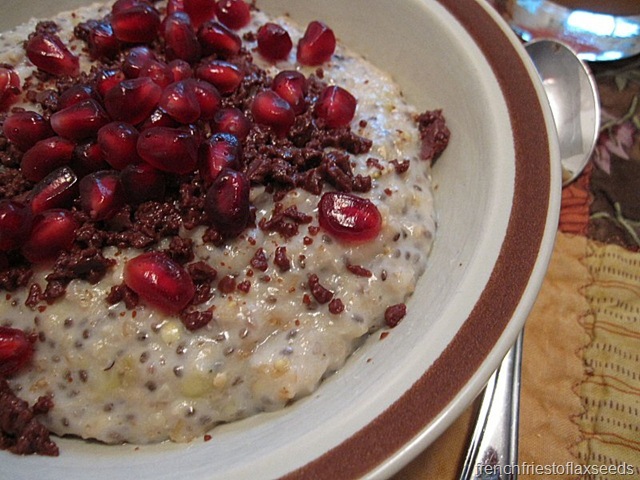 girl your oat creations always look sooo good! good luck studying!